3 weeks ago today one of my creative heroes, David Bowie, passed away. I stared blankly at my phone screen in bed on monday morning - crestfallen - in stark contrast to 8th January 2013 when I woke up to find the world talking about his 66th birthday due to the announcement of his first album in 10 years. I guess the news was a hard pill to swallow because true heroes are infinite (not just for one day) and his supernatural properties of reinvention and constant innovation had allowed me to forget that behind all the majesty beat a human heart. Life is a work of art. In both life and death, Bowie was a true artist. Even when things were going dark for him he created Blackstar as a legacy and final gift for fans, and he maxed out on using his career as a creative canvas upon which to play and grow. This to me is a perfect model for how to live; by bringing our own colour into the world. We can, and should, re-invent. 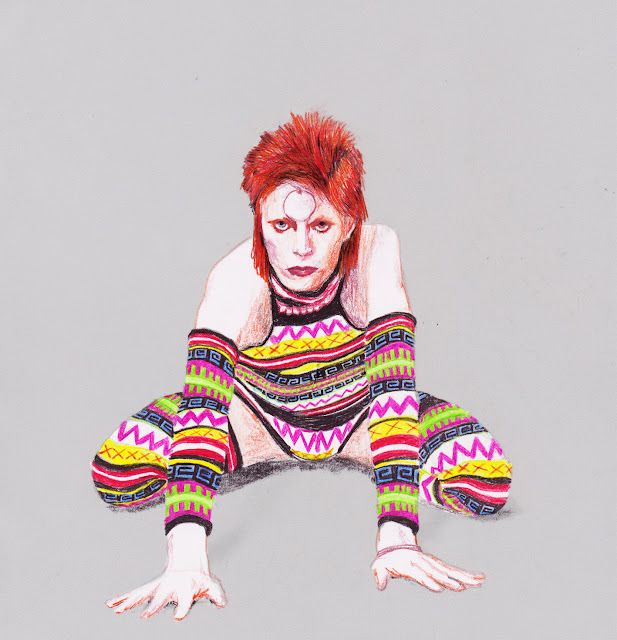 The evolution of Bowie as a performer has been continual, and at times bonkers. He moved on from a style before people could get bored of it, and created this perpetual 'newness' that left everyone hanging on to what he would do next. That's a really exciting thing to do as an artist, and rather than just 'trying on' completely different genres I feel this was him exploring his different facets, leading explorative movements in the self. We are malleable creatures with a range of possibilities, and we shouldn't limit ourselves. Show your true self to the ones you love. We, the public, see super dude David Bowie, but one thing that inspires me a lot is Iman's sentiments on him as her husband. "I fell in love with David Jones. I did not fall in love with David Bowie... We have fun with each other. He's very English in a way that he's a gentleman." I think finding people to nurture and share in your very core is vital, no matter what crazy adventures you may find yourself on. Use your influence to liberate others. I think I was drawn to Bowie in the first place because he made it feel okay for me to be myself. "It wasn't just about the music: it was his style, his soul, and the challenge he posed to the order of the times. Whether we were closeted gay teens, secret scribblers of angst-ridden doggerel, singers into hairbrushes in front of bedroom mirrors, or simply escapist dreamers, Bowie helped us become the people we needed to be. After Bowie, our lives would hitherto always be different." - Katheryn Flett for The Telegraph. 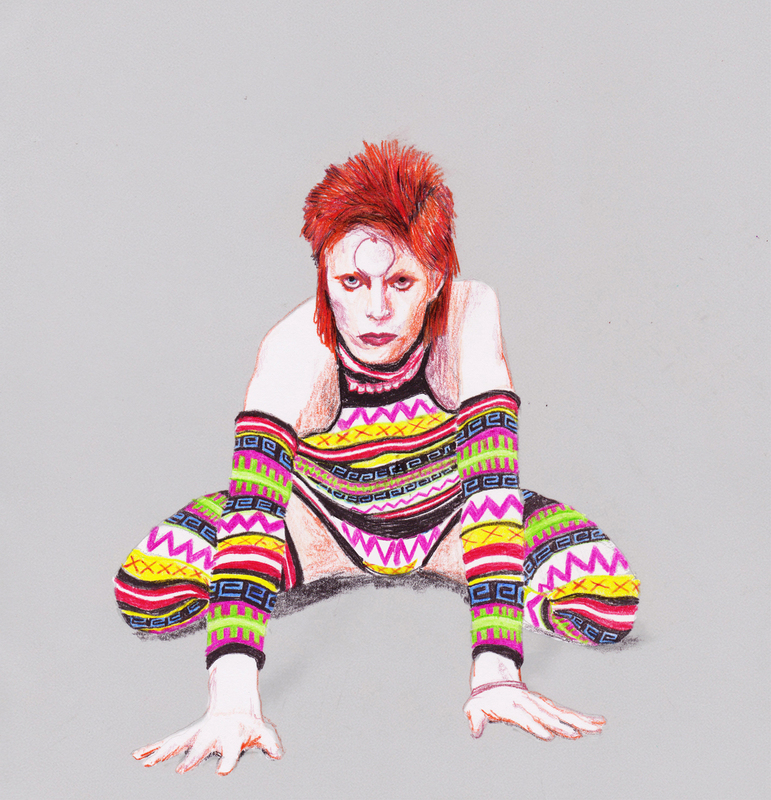 What made Bowie so iconic was that he used his persona to liberate the nuances within individuals and within society. Talent doesn't favour the rich. As Billy Bragg pointed out: "It is not only the timing of his death and the fact that he was 69 that links Alan Rickman to David Bowie. Both were working class kids from council estates who went to art school where they gained enough confidence in their own creativity that they were able to go on to find fame and fortune. Is it still possible for working class kids to realise their potential in such a way? The art schools are almost gone, those that survive now charge a fortune. The social mobility that Rickman and Bowie experienced is increasingly stifled." This rings out like a chorus of bugles to me: how can we expect a new generation of influential artists to rise if the arts aren't within their reach? Genius is not proportional to income; we need to invest in the arts so young people can become starmen and women whatever their background.